Radiology Masterclass provides online medical imaging educational resources for medical students, junior doctors and allied health care professionals. Build your skills in medical imaging by using our free to access material, and then sign up to a course completion assessment to prove your knowledge. Sign up to one of our online certificated course completion assessments today. All our course completion assessments award CPD/CME credits in accordance with the CPD Scheme of the Royal College of Radiologists, London, UK. To learn the art of X-ray interpretation, start here! Consolidate the knowledge you have gained in the tutorials section by reviewing sample cases in the X-ray Galleries. Please sign up to the Radiology Masterclass email newsletter to keep informed about new content, offers, competitions, and the affiliation scheme. 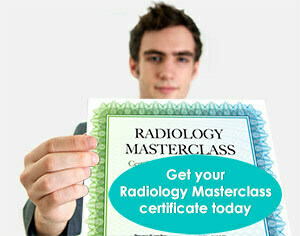 Follow Radiology Masterclass on Facebook to hear when new content is published. Co-authored by the author of Radiology Masterclass, Radiology at a Glance is a complete overview of medical imaging suitable for medical students, junior doctors and other health professionals. Second edition published September 2017.